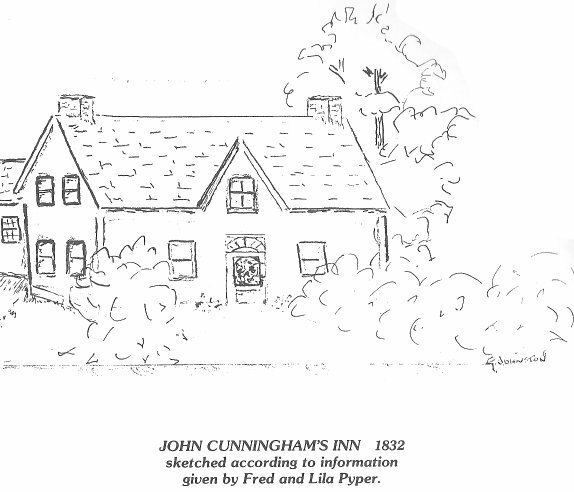 Cunningham's Inn was a well-known establishment in the Township of Gloucester. from a book called Bowesville: A Place to Remember by Grace Johnston. in total, were about 40 feet by 40 feet. A large building for it's time and place. the William Kennedy family of Nepean. custody of Mary Teresa until the age of 21,but Mary died at the age of 15. John's first three children and her last three children if I recall. UNDER SARAH TIGHE, the comments regarding Theresa McGrath. Are you able to send your notes for Cynthia, myself and Al??????? married (2) Elizabeth Caroll Abt. 1868. 4 iii. Catherine Celia Cunningham, born Unknown in ?. She married William Fitzsimmons. 5 i. Margaret Jane2 Cunningham, born Unknown. 6 ii. Annie Cunningham, born Unknown. 7 iii. Elizabeth Cunningham, born Unknown. in Gloucester, Ontario. He married ?. 9 ii. Patricia Cunningham, born Unknown. 10 iii. Bartholomew Cunningham, born Unknown. 11 iv. Michael Cunningham, born Unknown. 12 v. Catherine Cunningham, born Unknown. 13 vi. Mary Ann Cunningham, born Unknown. 14 vii. John Joseph Cunningham, born Unknown. Guardian denounces administration on the proceedings. of Lot 16 in the 3rd Concession. years. Sadly Mary was only 15 when she died. Stated in her will. Buried in Notre Dame cemetery. said infant has renounced administration. herewith and verified upon oath. Honorable Court. Dated at Toronto, 5th day of December, A.D.1894. were passed onto Michael her brother. and Testament regarding Elizabeth (Cunningham) Carroll. the petition for letters of Administration herein. thousand eight hundred and eighty six. Signed by Mrs. Thomas Carroll. JOY, JOHN DIED IN 1870 AND THIS BATTLE WENT ON TILL 1886, SIXTEEN YEARS. Hello Guys! I have been going over my records and the information you sent Taylor. spelled wrong. She is Teresa Mary McGrath who died Dec 6,1990 in her 96th year. I have a clipping of her death notice. Lists her step children and her three sons. yrs old. Correct me if I'm wrong. a Laborer and died when he accidently fell off of a building under construction. 2-Margaret (Maggie)  Sister Mary Reginald. Maggie became a nun at age 17. She lived in Louisville, Kentucky, USA. 3- Anne  Married  John McCrank - Farrellton Que. Ellen(Elizabeth) Carroll Cunningham had a brother Dan  M  Elizabeth Casey. St Mary"s Church Ottawa Oct 15-1912  Another Kennedy for you Taylor!!!!!!!!! 2-Elena Jane (Lena) 1888-1972   M  James Sullivan  1886-1962   Aug 1-1911. Julia in the 1871 North Gower census. My uncle kept many family records , he told me Judy was adopted. youngest son James played together as children : They were around the same age. were some comments regarding Theresa McGrath. I looked but couldn't find them. Cunningham. The other two pages relate to Michael Britt and Andrew Fogarty. this deponent and the same were executed at the City of Ottawa aforesaid. Signed by John E. O'Meara. Effects of the said deceased. one thousand eight hundred and eighty six. Signed by Catherine C.
the Personal Estate and Effects of the said deceased. of the Township of Gloucester in the County of Carleton. MARY ANN CUNNINGHAM and JOHN JOSEPH CUNNINGHAM. was his own absolute property. since accumulated amounts to in or about the sum of Three Thousand Dollars. Signed by Catherine C. Fitzsimmons, February 27, 1886. Township of Gloucester, in the County of Carleton, farmer. for a grant of Letters of Administration. with or received by me. of Michael Britt, of the same place farmer. place of abode at the Township of Gloucester in the said County of Carleton. Petitioners knowledge, information and belief. Honourable Court. Dated this 15th day of February A.D.1886. having since his death intermarried with the above mentioned MICHAEL BRITT. same and she made her mark in my Province. Elizabeth could not write. Estate and Effects of the late JOHN CUNNINGHAM. Thousand, Nine Hundred and Seventy dollars. same and she made her mark in my Province. of his said decease been unaware of what it amounted to until advised by MR.
Two Thousand, Nine Hundred and Seventy dollars. administration whenever required by law so to do. Except for the last two children Mary Ann and John Joseph (from Taylor's listing), who were probably born after the 1881 Census, and the addition of Elizabeth Cunningham, age 7 in the 1881 Census with this family, the other children in the Census are identical to Taylor's listing, this appears to be the correct John Cunningham, son of John Cunningham and Catherine Gilligan, however with this John's age as listed 67 years old, he would have been born about 1814 and died 22 Dec 1885. Therefore His father John Cunningham and Mother Catherine Gilligan would have been married before 1814. I would also assume that John's wifes name was Bridget, and her age was only 30 years old, making her born about 1851. I also ran across another listing in the 1881 Census, and this was a Catherine Cunningham, however she lists her age as being only 80 years old in 1818, making her birth year about 1801, and Catherine Gilligan was listed as being born around 1791. Except for the age difference, this could well be Catherine Gilligan, first wife to John Cunningham. I wasn't aware that there was such an age difference between John and his wife Bridget. I've added a link for Bridget Cunningham to your census data (above). back on Elizabeth Carrolls. Her's is a long one also. I am very interested in those descendents that you know of Michael William. Kennedy's descendents in Huntley. So much to do, so little time, huh. Tommorrow - finally a WHOLE DAY at the archives. Hope I hit a gold mine. included them in this listing. CUNNINGHAM and Elizabeth CARROLL, who married John MCCRANK in Farrellton, Que. my wife, Sarah MCCRANK, was born. singer Elton BRITT...dunno if there's any truth to that. James MCCRANK, who married Margaret MATCHETT. was more than one John CUNNINGHAM, including one who was an army veteran. glad you folks have been able to. but nothing like anxious cousins on the other end for motivation! John and Elizabeth (CARROLL) CUNNINGHAM KENNEDY BRITT. CUNNINGHAMs out there descended from this branch? pie:)  Needless to say, any help you can provide would be appreciated! Catherine (CUNNINGHAM) FITZSIMMONS is buried there. forward to your consideration of the foregoing, and thanks! family. The backup was not identified, and I did not question it. to where your wife fits in. I hope I have answered some questions asked and not asked. My husband is the Great Grandson of Elizabeth Ellen Carroll and John Cunningham. Elizabeth (Cunningham) Carroll and Anne (Cunningham) McCrank are sisters. gave me a grand tour of the homes and places of interest in Farrellton. with his first wife. She is mentioned in the Letters of Administration. Also his loving wife Elizabeth Lawson died May 21, 1900 aged 88 years. Natives of Co. Armagh, Drumgar, Ireland. May their souls rest in peace. CATHERINE CUNNINGHAM died February 10, 1923, aged 83 years. wife Catherine Gilligan. Her full name was Catherine Celia Cunningham. of labourers who may have worked on the railroad at Gloucester Station in 1851.
age 3 and Anastasia Cunningham age 1. Step son John Cunningham is a widow and age 38 yrs. Elizabeth (Carroll) Cunningham is a widow age 26 years. It appears the Inn or Store transferred hands maybe when Catherine Gilligan died to Bartholomew Gilligan. Nice to finally know who this John Cunningham was. deceased family members if that is such a case, I say it has been a challenge with her. Bridget Christopher daughter of so and so. No parents are noted for John or deceased wife. visible record in ways of tombstones that have been found to substantiate the deaths of both John Cunningham Sr.
that data in a file somewhere, maybe forever lost. Their descendents demonstrate they lived but as for data it doesn’t, for now. Ø      John Cunningham Sr. died at the end of February, start of March 1870. Ø      That he was widowed in the 1861 census and married Elizabeth Carroll as early as 1862, based on the children ages. Ø      Left a widow with three children and that John Cunningham Jr. was also a widow in the 1871 census. is in fact this John Cunningham. Ø      And that Catherine’s sister Mary Ann died 9 years prior to the date signed by Catherine Fitzsimmons of 1886.
prior to their father’s death in 1870. Andrew Fogarty who was involved with the match making. to Elizabeth McGrath, Michael’s sister. single floor shanty. Michael Carroll and Anne O’Leary married September 20, 1844 in Huntley Township, St. Michael’s Church. Daniel Carroll’s name comes from his grandfather Daniel O’Leary and Elizabeth Carroll from her grandmother Elizabeth O’Leary. died at a young age also in 1887, aged 42 years. Rest now Elizabeth, you've done your duty with heart. tree on Ancestry.ca. Thank you SO MUCH for creating this wonderful resource! and Patrick (b. 1859, Windsor Hotel Innkeeper). > Jean Jacob Fink (b. 1820 Austria) and Esther Campeau of Ottawa are my GG grandparents. > It was in Mattawa, Ont. that my grandparents, Robert Cunningham (b. 1899, son of John & Sarah Jane) and Leonie Fink (b. 1901, daughter of Joseph Arthur & Emma Bangs) were both born and married. Fink ancestors in the Ottawa area! or ideas where I might be able to find more information or if you could direct me to other researchers. settlement. He deposited this money in the Quebec Bank in Ottawa and died a few months later in 1871 without a will. Michael Britt by then, it must have seemed a small fortune sitting in the bank waiting to be claimed! You are welcome to add my e-mail to the John Cunningham and Jean Jacob Fink pages respectively on your website. Perhaps we'll discover some new connections! congratulations for creating the Bytown or Bust site!